This is George and CC. As you can see, they're quite fond of one another. George's spelling is shite, but I think that can be excused, considering his obviously good intentions. George and CC, my and A. 's British, highbrow, and heavily accented alter egos, were created in the interesting-only-to-them way that all inside jokes and pet names are born to couples. The story would bore or nauseate anyone other than ourselves - probably both. The important thing is that they were born, circa April 2012. CC and George had their golden age while my dad was dying. It was a remarkable thing: the worse things got, the more clever their exchanges and frequent their appearances became. Coping mechanisms: curious, random, useful. Anyway, I came home to this (ob)scene upon my return from Florida: George and CC, heretofore just characters in our heads, brought to tangible, touchable, fluffy life. A lamb and a triceratops. What more natural pairing could there be? 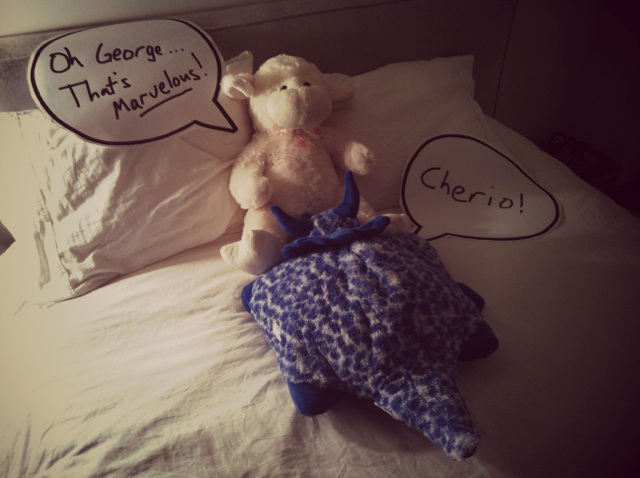 But George and CC weren't alone on my bed. 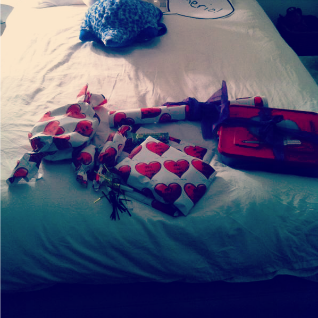 They were accompanied by a medium-sized stash of gifts. Wrapped in custom paper. That A. had designed and printed himself. 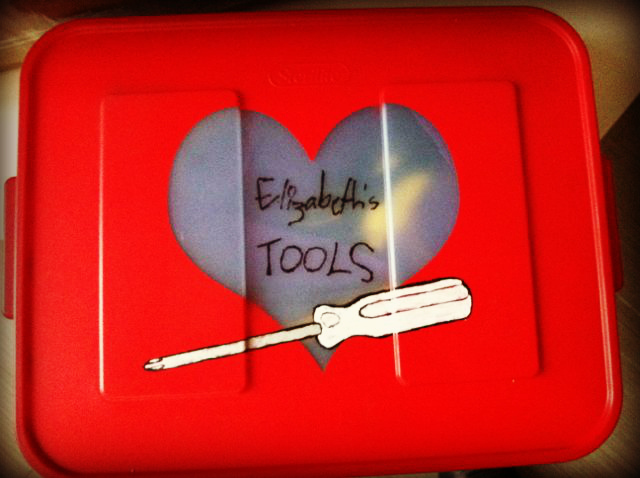 Among the gifts were two boxes of tools A. had packaged up and sent from my dad's house in Florida, before he'd left. 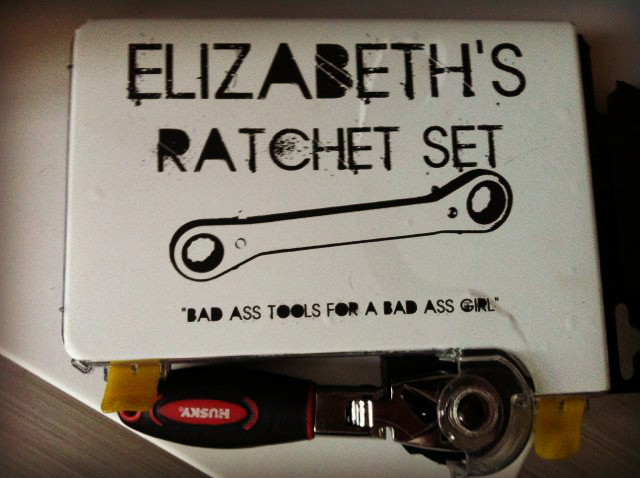 My dad had several complete tool sets and hundreds of spare screwdrivers, wrenches, etc. A. had assigned himself the task of curating the collection to assemble some necessities for me to keep back at home. He'd sent them on ahead of us, and when they arrived, he repackaged and decorated them, then wrapped them and left them in my apartment for me to find, first thing, when I got home. 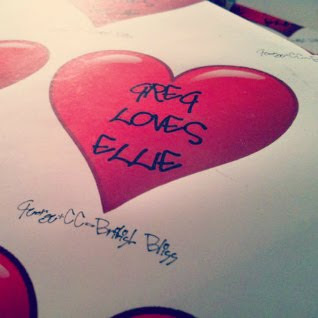 The inside covers were inscribed, too. Inside my refrigerator were gift-wrapped milk, eggs, and cereal: a few staples so I wouldn't starve until I had the time and strength to make it to the grocery store. That's what I came home to, after burying my father.